AJA’s ROI-HDMI Mini-Converter allows exceptionally high quality conversion of computer and HDMI outputs to baseband video over SDI at an affordable price and a very portable size. With extensive audio functionality, incredible image scaling as well as aspect and frame rate conversion, ROI-HDMI fulfills the growing need to properly incorporate computer signals into the video world without sacrificing budget or space. 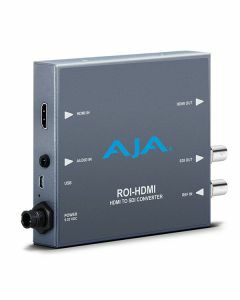 AJA’s ROI-HDMI Mini Converter allows a computer based user operating with an HDMI output as a video source to select a region of interest and scale the output to fit a working resolution. This makes it straightforward to broadcast segments of a computer monitor without the assorted detritus of on-screen workspace menus. Extra interface clutter and menu bars can be eliminated to focus on a single part of the screen. However, the mini converter retains top quality video characteristics because cropping and scaling is carried out by integrated hardware. The HDMI loop and SDI output both receive embedded audio and it’s possible to also embed analog stereo audio into the video output thanks to a 3.5mm jack. The converter accepts 2-channel audio from this jack or embedded 8-channel from an HDMI input. The AJA ROI’s Mini-Config software allows audio source and routing customisation and is embedded in the SDI output; meaning computer audio can be embedded within the SDI signal or simple synchronised routing. Note: Frame rates limited by the 166 mHz max pixel rate of the HDMI receiver.